2. Click on the House icon and then open the Blue sales folder that you will be building your Membership. See Creating a Sales Organization Folder in Administration for more instruction. 3. Open the Membership folder and click on the Membership icon. 4. In the Membership field, right-click and select New. The Membership: New window will appear. A) Internal Name: (required) Name of the membership that will appear in the AMS Sales Screen. Can be a shortened name. B) External Name: (required) Title of the membership program that will appear to the customers online. C) Sales Line Type: (required) Defines the actual items being sold (i.e. Membership, Passes, etc.). D) Specify Renewal Grace Period: Allows expired members to renew a certain amount of days after their membership expired. E) Prompt For Renewal: Will notify the customer (online) and box office staff (in AMS or POS) a certain amount of days before a membership is due to expire. F) Project Code: This can be a customized code that would be used for internal reporting. G) Enable: (required) This needs to be checked to make the membership program active. H) Membership ID must be input at time of purchase: Requires that you enter the member number in for every order. I) Approval is required for membership activation: Will not allow a customer to access their benefits until a staff member has approved and activated the membership. Static Expiration: All Members will expire on the same day no matter when you purchase them. Best used for film festivals or anything with static dates. Sliding Expiration: No matter when a membership is purchased it will expire a specific number of months later. Best used for year-around theatres. 6. Click on the Sales Channels tab to place the membership on sales dates and times. NOTE: Make sure to extend your End Date to a future date so the membership stays on sale. Agile recommends at least a few years. 8. The Delivery tab allows you to choose how your members will receive their member cards. Check-mark the appropriate delivery method. NOTE: If your organization has hired Agile to process and fulfill your memberships, please make sure to check the appropriate Agile Fulfilled delivery option and enter the date to start the fulfillment. You can also enter any notes for our fulfillment team. 9. Access Buyer Types allows you to choose the different Buyer Types that will be allowed to sell this membership. This is a required function. In most cases, it is best to add all your active buyer types here. a. Select the organization from the drop-down. 10. The Short Descriptive tab is where you will be able to put a short synopsis or description of what is available through this membership. 11. The Description tab is where you will place a longer description about the membership. 12. Extra HTML tab allows you to add long description information for this membership. 14. Click on the Image tab to upload any marketing image for the Membership. 15. Hit Apply and OK.
*Note: The next step is to build your Member Benefits Groups. Do not build the membership prices until you have created your Member Benefits Groups. 16. In your Membership folder select Benefit Groups. 17. 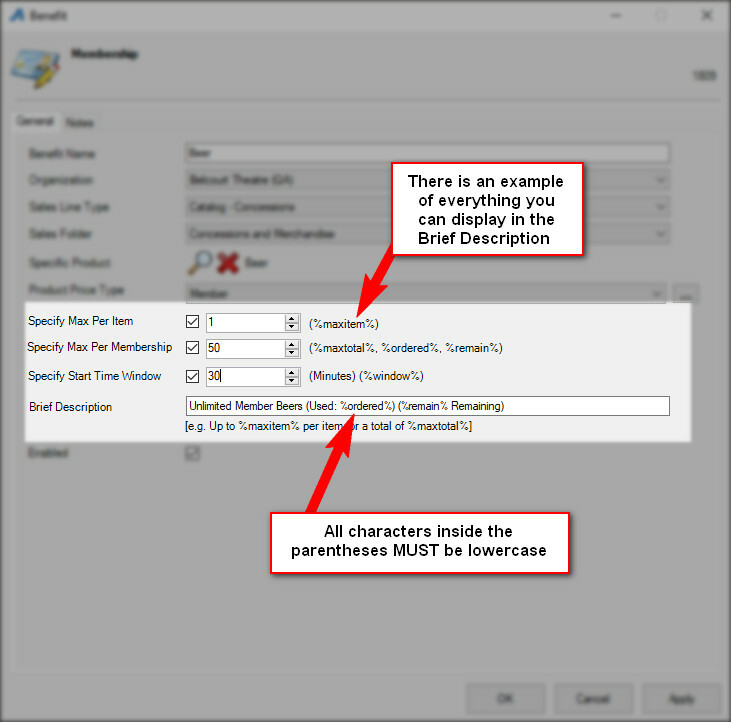 Right-click in the Benefit Group field and select New. 18. Name the Membership Group. This is usually the same name as the membership type or level. If your benefits change from year to year, we strongly suggest adding the year to the benefit name (i.e. 2017 Flex Season Benefit). 19. Add a description for this Benefit Group that includes a description and list of the benefits that this level receives. This can be used for internal reference as well as a way to merge Member Benefit information onto your Member Welcome Letters. 20. Hit Apply and OK.
21. In the Membership folder click on the membership and select the Membership Program the pricing will be built under. 22. Under Membership Prices, right-click and select New. 23. Membership Price: New: right-click in the Price box and select New Price. 24. The Price: New window will appear. 25. Click Apply then OK.
26. In the Price Distribution: New window, right-click and select New. Unredeemed/Redeemed Account: choose the appropriate Revenue Payment Accounts here from the drop-down. NOTE: If the price also includes a fee, repeat the above steps but choose Fee in the Price Category. Effective Sale Date: choose the date the price should be effective. This can be set in the future and Agile will automatically change the price at the set time. 27. Click Apply then OK once all the pricing information has been created. B) Set the Price Type. Customers will see this name so make sure to choose something that is clear. C) Set the Level. Agile recommends that organizations group all their memberships by level. For example, a student membership and a student complimentary membership would both use "Student" for the Level. D) Select the Functional Area. Select Level 1 - Restricted Price for any price that should not be for sale to the general public. F) Choose Card Per Member if the membership type allows for multiple cards to be printed OR Single Card if only one card per membership will be printed. G) Set your Expiration Date: This determines how long the membership is good for. For Static Expiration memberships, choose the exact date that the membership is due to expire (i.e Festival Passes expire on Jan 1, 2020). For Sliding Expiration memberships, choose how many months the membership is available (i.e. Membership is good for 12 months). H) Set your Display Sequence: The display sequence determines what order the memberships will be displayed online and in AMS. I) Select your Quantity Restriction: Min and Max: This limits how many memberships may be bought at a time. J) Select your Multiple Customers: Min and Max: This limits how many customer names are on a membership (i.e. for dual memberships, set the min and the max to 2). M) For renewal prices, make sure to check the box next to Membership Renewal. 28. The Description tab allows you to add a description of this Membership Price. 29. Under the Card Image tab you can add the image you want to show up on the card. 30. Under the Promotion tab add promo codes if this Price needs a promotion code to access the price. See Promotional Codes: Creating and Attaching Codes to Prices for more information. 31. The Questions tab allows the client to add order questions you want a customer to answer before checkout. See Creating Order Questions for more information. Move the question from the Available Questions column to the Selected Questions column to activate the questions for this price. C. For a Static Expiration Membership, choose the Effective Start Date and the Effective End Date for the exact dates you want the benefits to be valid for. For a Sliding Expiration Membership, set the Effective End Offset to the number of months the membership benefits will be available. A. Right-click in the window and select New Static or New Sliding. D. Check Attach to Membership if all members on the membership should have access to this benefit. If this is unchecked, this benefit will only allow the purchaser of the Catalog item (ticket packs) access to this benefit. E. Check Require Active Membership if the customer's membership must be active for them to receive their benefits. 34. The Donor Management Tab: This is only available for Donor Perfect clients. Select the appropriate items from the drop-downs. See these articles for more details on this tab: Gift Properties and Other Item Properties. 35.The Auto-Renewal Tab: here you can set up this membership price to be available for automatic renewal. Make sure that the Allow Auto Renewal box is checked. Select the renewal price from the drop down as well as a delivery method. Finally, define the how many days before the renewal the customer will be notified. 35. Hit Apply and then OK. To add multiple sales channels, click Add New and change the sales channel on the General Tab. 36. Select the Benefit Group icon. Select the first Benefit Group you created. 37. In the Benefit field, right-click select New. 38. Select the type of benefit. A) Event/Showing Benefit: Points to a Showing or Event ticket type (most commonly used). E) Show Benefit: Points to a particular Show ticket type (for example, if there are multiple performances of the same Show and the member should have access to all of them, use this benefit). D. Sales Folder: Choose the specific folder or select All. E. Specific Event/Showing: If a benefit is only valid for a specific event/showing, select it using the magnifying glass. 1. Click on the Magnify Glass icon to select a single item/show/event from that sales folder. F. Specify Tier: select the tier you want them to redeem for. If you keep blank, it will point to all different Tiers. G. Specify Ticket Type: Select the ticket type you built under your events that you want the benefit to redeem for. H. Specify Max Per Item: Set the benefit per item, i.e. customers get 2 tickets per event/show at the membership price. I. Specify Max Per Membership: Set the benefit per membership, i.e. customers get 2 tickets at the membership price but for any of the events/shows. J. Specify Start Time Window: Enter in the amount of time that must occur between showings. This prevents customers from using their benefits on two shows at the same time. 40. Hit Apply and OK.
*PLEASE DOUBLE-CHECK THESE AS YOUR BENEFITS WILL NOT WORK CORRECTLY IF YOU HAVE POINTED TO THE INCORRECT TICKET TYPE. It is recommended that you test all benefits online and in-house with sample memberships levels prior to selling to customers.